Baylor Baja was established in 2009 by a devoted group of hardworking Baylor students. This team set out with very little backing or previous knowledge of how to build a successful Baja car. Despite these setbacks, the team took the first generation Baylor Baja car, nicknamed "Hulk," to the SAE competition in Wisconsin in 2012. The car placed 74 out of 102 teams. Since the inaugural year, Baylor Baja has grown into one of the largest engineering student organizations on the Baylor campus. The Baja SAE organization consists of 75 members and is supported by 25 different sponsors. Not only does Baylor Baja provide students with a wide variety of hands-on design experience outside of the classroom, students also learn key business principles as they consider the economics of their design; design a robust marketing plan encompassing the large scale production and sale of their vehicle; and present production plans, advertising strategies, projected growth, and projected profits to a panel of corporate investors. “It is important to note that through Baja, our students are not just putting together a go cart. The students are challenged to step far beyond the classroom as they apply theory from all classes and levels to develop a marketable product," said Dr. Lesley Wright, faculty advisor for Baylor Baja. “From setting initial specifications to evaluating design decisions to meet those specifications, the students are challenged to expand their way of thinking. Not only do they produce a drivable vehicle, they must defend every aspect of their design to a panel of expert engineers. While driving the car is the fun part of the experience, it is only a small portion of the complete experience." Even when the Baylor Baja team is not driving the car or working on the design, they are putting in hundreds of hours of work evaluating every detail of the car’s design and the performance of their car as they competed in off-road events against 100 universities. 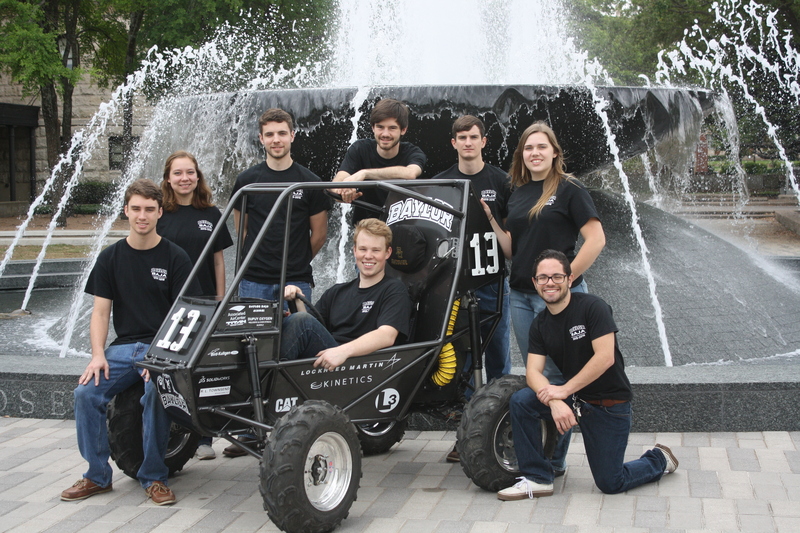 This year Baylor Baja placed 46 out of 100 teams in the Baja SAE Collegiate Design Series. “As we move forward, we are looking to improve the long-term reliability of the Baylor Baja cars. This involves a more robust data acquisition system to both monitor the car’s performance in real-time while measuring actual forces transmitted through the suspension to the chassis," said Dr. Wright. “In addition, manufacturing practices will also be a primary focus of the team. Developing fixtures and jigs to fabricate components with increased precision will lead to a more reliable car. We look forward to better equipping our shop to meet these goals." While the students look forward to improving their ranking each year, the mission of Baylor Baja is not all about beating the competition. This group makes it a priority to use their talents to help others. Over the past year, students have teamed with the Fort Hood Area Habitat for Humanity, volunteering some of their free time to work with the Habitat for Humanity staff on various projects. The students look forward to growing this relationship in the future. The Baylor Baja Organization relies solely on donations from external sponsors to compete in this comprehensive design experience. To support Baylor Baja, click here.